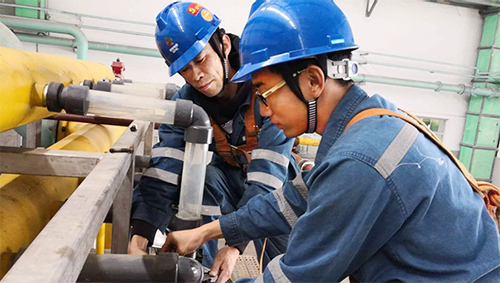 In order to enhance young staff's business skills and comprehensive quality, strengthen young staff development and promote quality growth of the company, on 19 October, Wuhu Electric Power Generating Company introduced the mentor scheme to nurture young employees through mindset guidance and skill teaching. The programme is an important method to promote staff training and service reform. With a focus on providing guidance on thoughts, work style, safety and skills, the company made serious efforts to formulate the training programme, specifying things to learn and measures to be implemented and selecting a batch of obedient, responsible and outstanding employees for the scheme. Through voluntary and two-way selection, 23 pairs of mentors and students were formed. The programme will excite young employees' enthusiasm to learn technology and business. In recent years, Wuhu Electric Power Generating Company has placed a great emphasis on nurturing young skilled personnel. Through improving talent incentive mechanism, adopting a skill developing model that combines training, competition and usage, and fostering a learning atmosphere that upholds skills, the company has nurtured a number of post-80s and post-90s "skilled workers", continuously supplying the company with qualified staff.